The recent fashion for vintage products, cars and clothing in retro style has not bypassed the design of wooden products. Processing of antique wood allows in new buildings to create an interior that looks as if the apartment was inherited by the owners from their great-grandfathers. The owners of country houses make out the old tree facades and interior space. Artificially aged wood is used to make decorative fake lamps on the ceiling, stairs, doors and other design elements, giving the house a resemblance to a medieval castle or a fabulous forest hut. It is recommended to practice probes before performing work. The high cost of artificially aged wooden objects makes home craftsmen a desire to do the right things with their own hands, seeking at once to reduce the price of the product, and its genuine uniqueness. It is not as difficult to do the work of aging a tree as it may seem from the outside. 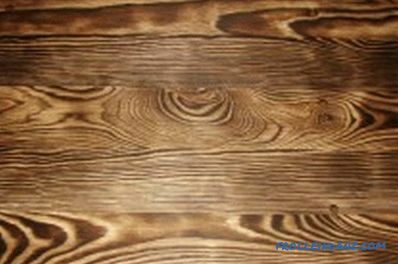 You only need to know about the main ways to achieve a beautiful textured surface on conventional lumber, which can be purchased at any firm that sells building materials and wood. How to prepare for work? 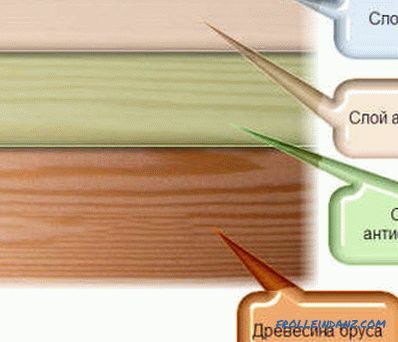 There are 3 methods of aging wood: chemical, thermal, mechanical. mechanical (brushing) - suitable for softwood and oak. By purchasing boards or cant from which you plan to create an artificially aged thing, you can choose specimens that have already been damaged by a bug, have chipped and potholes, small cracks and knots on the surface. After the treatment, they will give particular charm to the “old” item. Ready-made furniture for aging is selected massive, slightly rough or in a rustic style, similar to hand-made piece furniture of the last century. 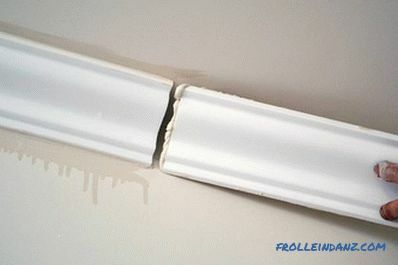 Before decorating in any way it is best to disassemble the piece of furniture into its component parts. This will allow all surfaces to be treated without leaving untreated areas in hard-to-reach areas that will catch the eye. 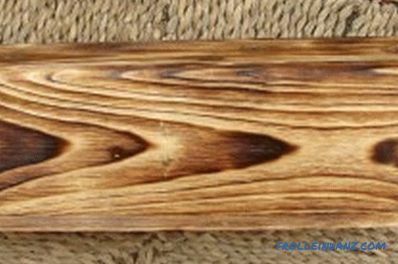 Before you start decorating an object for the first time, you should practice and fill your hand on various junk pieces of boards and any wood. The master will act more confidently, with knowledge of many nuances that may arise during the work. On the same textbooks, it is convenient to choose the tone of paints or stain, to estimate in advance what will be the result. 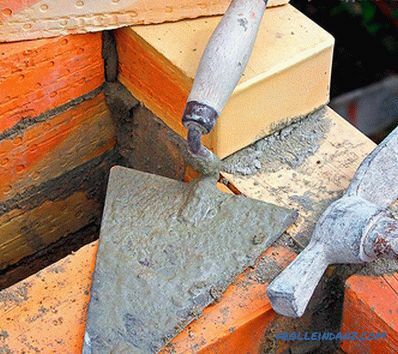 Many operations (brushing, painting and drying after it, firing) should be performed outdoors. Drying, painting, brushing is recommended to be done outdoors. Coniferous wood materials are most available for purchase: pine, spruce, larch. They have a pronounced structure and pattern formed by fibers of different hardness. This makes them suitable for mechanical decoration. On the surface of the board, bar or log with a sharp corner of the ax to put holes in various depths and vastness in a chaotic manner. The corners of the bar a little to cut with an ax, not caring for accuracy or a flat surface. After that, all surfaces treated in this way must be carefully polished with a stiff brush with steel bristles. When grinding a large product is better to use a drill or grinder with a special nozzle. It is necessary to grind until all the sharp edges that have arisen while chopping with an ax, will not get the outlines of natural damages smoothed over time. It is important to remember that the movement of the brush should always be directed along the fibers. The next step will be sanding to remove protruding fibers and a steel brush with softer bristles than the first time. 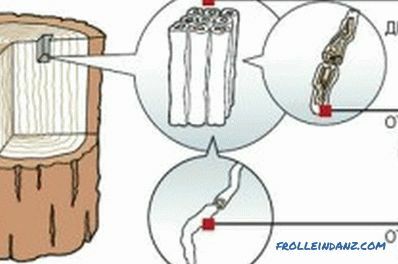 In this part of the soft fibers is removed, forming shallow depressions between the ridges of the harder winter wood fibers. With the same brush, you can additionally highlight knots and cracks. 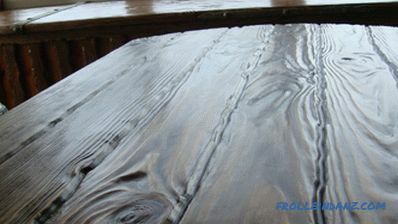 After grinding the light surface of a new product, it is necessary to impart an old wood darkening from time to time: paint it with stain or dark acrylic paint.After drying, the sandpaper with an average grain without a strong pressure to wipe a little tree, removing the paint from the protruding ridges and hills. In this case, the dark color is preserved in the hollows and between the fibers. For final finishing, the product is coated with acrylic transparent or light yellow varnish, dried until it is completely dry. A more "humane" way. Suitable for medium-sized products and furniture, wooden utensils and other small surfaces. Brushing is done manually with a brush with metal bristles. In this case, as in the previous case, the soft fibers are removed, leaving ridges of hard wood. Hair brush sweep wood dust, controlling the process on the eye and achieving the desired degree of wear of surfaces. Then paint and decorate the product, as described above. 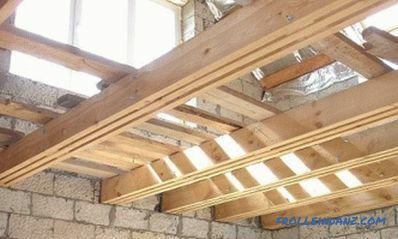 These methods can be called related, since the destruction of the upper layer of wood occurs almost without mechanical effects. These are more dangerous methods than previous ones, so treatment should be carried out in air and in compliance with safety measures. The essence of burning is that soft fibers are destroyed when exposed to open fire. For this, the surface of the workpiece is burned with a flame of a blowtorch or a special gas torch to a depth of 3 mm. With surface firing, the effect of aging will be insignificant, with a deeper one, it will be stronger. The master at the same time regulates the process depending on his taste and needs. After the top layer is charred, a metal brush or nozzle is applied to the drill, scraping the carbon to obtain the desired color and texture. It is possible not to expose such wood because it will already have dark and light areas. Final processing consists in sanding and sanding the product. With the chemical method, the decoration of a semi-antique tree occurs in the process of exposure to alkalis or ammonia. To do this, you can use aerosols for cleaning stoves or means for sewage. It is necessary to familiarize yourself with the composition of the product before use; Particular attention should be paid to precautions when working with him. Once on the surface of the wood, these chemicals "burn out" some of the soft fibers, while at the same time dyeing the tree gray. After processing, all surfaces are washed with water and covered with a weak solution of table vinegar or citric acid (1 tsp. Per 200 ml of water), removing alkali residues. When using vinegar, pay special attention to the fact that it should be table vinegar 9%, and not acid. Dried products should be brushed and painted if necessary. 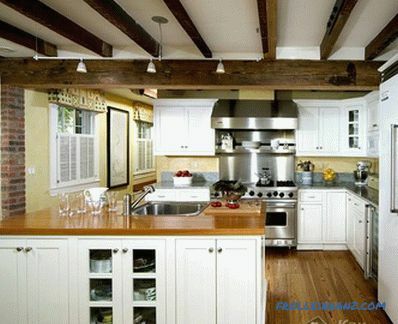 Woodworking using the methods listed above will help the owner himself to decorate the interior of an antique apartment without investing much money and not spending a lot of time on it. The availability of materials and tools for processing allows you to engage in this type of creativity and sophisticated master joiner, and novice, and even a woman with imagination and skilled hands.